Fromprivate spaceflights to NASA missions to the moon, Mars and beyond, the nextyear promises to be a busy one for Americans in space. Here's a preview of justsome of the coming attractions for U.S. spaceflight in 2011. Theyear 2011 could be the time space tourism finally makes it big. In October2010, the privately developed space plane SpaceShipTwodetached from its mother ship for the first time and glided safely to Earthfrom a height of more than 45,000 feet (13,700 meters), landing at the MojaveAir and Space Port in New Mexico. Two additional test runs followed shortlythereafter. SirRichard Branson's space tourism company, Virgin Galactic, is banking on SpaceShipTwoto carry up to six passengers at a time on a 2 1 /2-hour trip to the edge ofouter space, where they will experience a few minutes of weightlessness.According to the company, more than 370 wannabe astronauts have put downdeposits toward the $200,000 ticket to secure a seat on a future flight. AlthoughVirgin hasn't committed to a fixed schedule yet, SpaceShipTwo'ssuccessful test glides paved the way for a series of powered test flights inearly 2011. Designer Burt Rutanhas said that 50 to 100 such flights will be needed before Virgin can beginaccepting paid passengers. Whileone of NASA's twin Mars rovers lies dormant, the other looks set to keepon trucking in 2011, marking the seventh straight year of activity sincethe rovers landed on the Red Planet in 2004. TheSpirit rover, stationary since getting stuck in deep sand in April 2009,finally went silent in March 2010 and is thought to be hibernating. Meanwhile,Opportunity remains on course to visit the 13.7-mile-wide impact craterEndeavor. NASA'sMars Reconnaissance Orbiter has spotted evidence of clay minerals alongEndeavor's rim. If Opportunity can make it there, the rover would be able toconduct the first up-close inspections of Martian clays, which are believed tohave formed in the presence of water. Lookforward to a year full of electronic picture postcards as Opportunity continuesits 11.8-mile journey, begun from Victoria Crater in late 2008. As ofSeptember, the rover had covered half the distance to Endeavor. The trip wasoriginally estimated to take two years. Somenew players in transport to the International Space Station (ISS) could comeonline in 2011. Hawthorne, Calif.-based company SpaceXconducted the firstsuccessful launch and recovery of its Dragon capsule in earlyDecember 2010, marking the first time a private company has achieved such afeat. In2006, NASA chose SpaceXto develop a cargo launch system for the ISS. The company came up with Dragon,an Apollo-like capsule designed to carry up to seven people, or a mix of cargoand people. NASA's agreement with SpaceX calls for three progressively morecomplex test flights, but with the success of the initial flight, the companysaid it might combine the second and third flights and send Dragon directly tothe ISS as soon as next year. Asecond recipient of a NASA contract — Dulles, Va.-based Orbital Sciences— was scheduled to launch its Cygnus spacecraft in late 2010 aboard aTaurus II rocket, but the test was postponed until mid-2011. Theearly months of 2011 should see NASA missions make contact with a pair ofpreviously visited celestial bodies — one small, one large. Firstup is the Stardust-NExTmission, scheduled to fly within 200 kilometers (120 miles) of comet Tempel1 on Valentine's Day. In 2005, the Deep Impact spacecraft slammed an impactorprobe into Tempel1, leaving a crater 100 meters wide and 30 meters deep. Stardust-NExT(for Next Exploration of Tempel)will concentrate on taking high-resolution images of the comet's surface,including the crater, as well as measuring the comet's composition and the sizedistribution and flux of its dust grains. Thefollowing month, NASA plans to insert the MESSENGERspacecraft into an elliptical, 12-hour orbit around Mercury, the solarsystem's innermost planet. MESSENGER(short for MErcurySurface, Space ENvironment,GEochemistry,and Ranging) has already flown past Mercury three times in a series of breakingmaneuvers, sending back the first up-close views of the planet since themid-1970s and taking measurements of its magnetic field. Oncein orbit around the planet, MESSENGER will study its magnetic field in greaterdetail and examine Mercury's surface for evidence of volcanic processes. OnApril 12, 1981 — 20 years to the day after the former Soviet Union putthe first person in space — NASA inaugurated the space shuttle programwith the maiden voyage of the Columbia orbiter. In 2011, the shuttle program isset to come to a close. Inits 30 years of service, the spaceshuttle fleet deployed the Hubble Space Telescope and did the heavy liftingfor assembly of the International Space Station. The shuttle was originally scheduled to bemothballed in 2010, to be replaced by a new spacecraft calledOrion, part of the Constellation program initiated by the Bush administration.But President Obama reversed course, and Congress canceled Constellation inOctober. Russia'sSoyuz spacecraft or future commercial spacecraft are now set to take overduties of ferrying astronauts to and from the space station. At least two, andpossibly three, final space shuttle flights are scheduled for 2011. Humanitywill celebrate its 50th year in space on April 12, 2011. On that date in 1961,27-year-old Yuri Gagarin became the first person to reach space, orbiting Earthfor 108 minutes in Vostok1. Thespace race took off 23 days after Gagarin's epoch-making flight, when theUnited States put its own astronaut into space — 38-year-old AlanShepard, piloting the Mercury capsule Freedom 7. Since then, the only othercountry to launch a human into space has been China, although more than 30countries have contributed crewmembers to space flights. 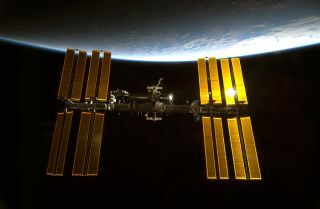 Alongthe way, a series of ever-larger space stations has maintained a human presencein space, culminating in the ISS, which has been continuously inhabited for thepast 10 years. NASAplans to put the finishing touches on the InternationalSpace Station in the coming year. Thelast remaining shuttlemissions will help do the job by hauling up large spare parts. In February,Discovery will take up a spare room for storage and a humanoid robot called Robonaut2. InApril, Endeavor will carry a $1.5 billion astrophysics experiment, the AlphaMagnetic Spectrometer, to look for signs of antimatter, dark matter and cosmicrays beyond the Milky Way. Andin June, a proposed mission of the shuttle Atlantis could bring up a cargo bayfull of spare parts and supplies. Together, the missions will end more than 10years of construction for the $100 billion space station, the longestcontinuously inhabited and operating station in space. NASAis making preparations for a rendezvous with an asteroid in August 2011. InFebruary, the Hubble Space Telescope acquired new views of Vesta, a 329-mile-longspace rock between Mars and Jupiter, to aid in the arrival of the Dawnspacecraft next August. Launchedin 2007, Dawn is on an eight-year, 3 billion-mile trip to explore Vestaand Ceres, the two largest known asteroids in the solar system. Dawn's missionis to better understand the formation of the solar system. Because asteroidsare left-overmaterial from planet formation, scientists expect to learn something from themabout what the early solar system was like. Thespacecraft's instruments are designed to hunt for water-bearing minerals and tomeasure the shape, surface topography, tectonic history, and elemental andmineral composition of both its targets. It is also expected to measure theirmasses and gravity fields. Poweredby a xenon ion engine, Dawn received a speed boost in February 2009 when itperformed a slingshot maneuver around Mars. Thecontrolled plunge of the Galileo probe into Jupiter's atmosphere in 2003 put anend to the first dedicated mission to the solar system's largest planet. Nowthe time has come for a return visit. InApril 2010, NASA engineers and technicians began testing and launchpreparations for Juno, Galileo's successor. Set to launch in August 2011, thesolar-powered probe will reach Jupiter in 2016, where it will enter a highlyelliptical orbit and use nine science instruments to begin studying theplanet's deep structure, atmosphere and magnetic field. Onthe mission checklist: investigating whether Jupiter has a solid core, mappingits intense magnetic field, measuring the amount of water and ammonia in itsdeep atmosphere, and observing the planet's auroras. Themysteries of moon dust and lunar gravity are in NASA's crosshairs for 2011, asa pair of new probes gets set to launch aboard an unmanned Delta 2 rocket inSeptember. Packed together will be the $80 million LADEE probe and the $375million GRAIL spacecraft. Itspartner mission, GRAIL (Gravity Recovery and Interior Laboratory), consists ofa pair of spacecraft that will orbit in tandem to map the moon's gravity inhigh detail, which will give scientists a better idea of its subsurfacestructure and internal history. Thetwo missions will separate only after they are en route to the moon, with LADEEexpected to take about five months to enter orbit and check its systems. Overthe past six years, NASA's Mars landers have studied the geology of the RedPlanet and discovered water ice at its north pole. The space agency is set totake the next step in its Mars program in 2011 with the launch of the $2.3billion Mars Science Laboratory. NicknamedCuriosity,the new rover is twice as long and four times as heavy as its predecessorsSpirit and Opportunity, or about the size of a Mini Cooper, and comes equippedwith a laser for vaporizing samples of rock. The goal of the mission is todetermine whether Mars was ever hospitable to microbial life. Engineerswere busy this year putting Curiosity through its paces. In September, theyattached and flexed the rover's jointed, 7.5-foot titanium arm, which willeventually sport a camera and a spectrometer to examine samples of rock andsoil where they lie. They have also been maneuvering the six-wheeled rover overa series of ramps in a clean room to test its mobility.